Kosovo (; Albanian: Kosova, [kɔsɔva] or Kosovë; Serbian Cyrillic: Косово) is a disputed territory and partially recognised state in Southeastern Europe that declared independence from Serbia in February 2008 as the Republic of Kosovo (Albanian: Republika e Kosovës; Serbian: Република Косово/Republika Kosovo). Kosovo is landlocked in the central Balkan Peninsula. With its strategic position in the Balkans, it serves as an important link in the connection between central and southern Europe, the Adriatic Sea, and Black Sea. Its capital and largest city is Pristina, and other major urban areas include Prizren, Peć and Gjakova. It is bordered by Albania to the southwest, the Republic of Macedonia to the southeast, Montenegro to the west and the uncontested territory of Serbia to the north and east. 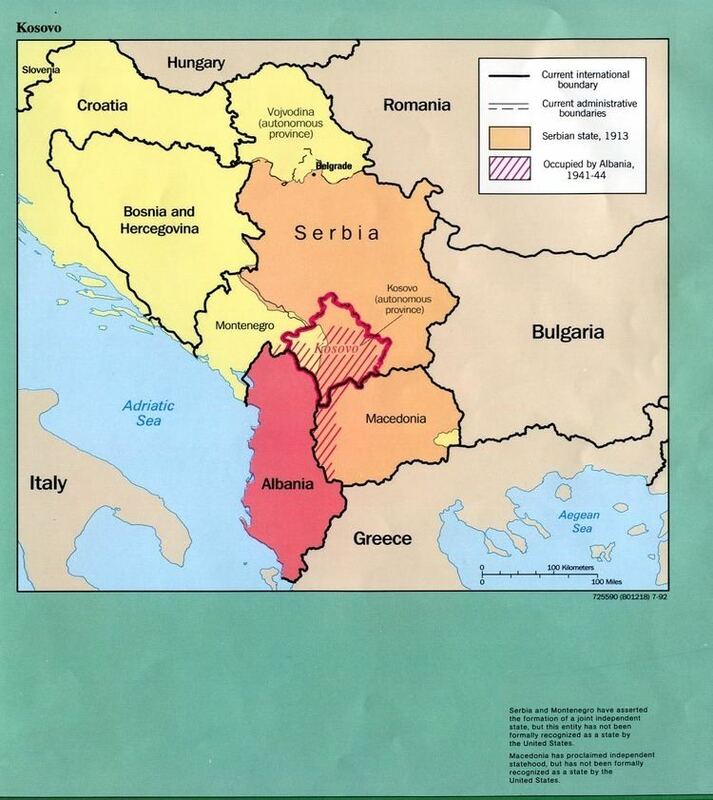 While Serbia recognises administration of the territory by Kosovo's elected government, it continues to claim it as its own Autonomous Province of Kosovo and Metohija. Kosovo's history dates back to the Paleolithic age, represented by the Vinča and Starčevo cultures. During the Classical period, it was inhabited by the Illyrian-Dardanian and Celtic people. In 168 BC, the area was annexed by the Romans. In the Middle Ages, the country was conquered by the Byzantine, Bulgarian and Serbian Empires. The Battle of Kosovo of 1389 is considered to be one of the defining moments in Serbian medieval history. The country was the core of the Serbian medieval state, which has also been the seat of the Serbian Orthodox Church from the 14th century, when its status was upgraded into a patriarchate. Kosovo was part of the Ottoman Empire from the 15th to the early 20th century. In the late 19th century, Kosovo became the centre of the Albanian national awakening. Following their defeat in the Balkan Wars, the Ottomans ceded Kosovo to Serbia and Montenegro. Both countries joined Yugoslavia after World War I, and following a period of Yugoslav unitarianism in the Kingdom, the post-World War II Yugoslav constitution established the Autonomous Province of Kosovo and Metohija within the Yugoslav constituent Republic of Serbia. Tensions between Kosovo's Albanian and Serb communities simmered through the 20th century and occasionally erupted into major violence, culminating in the Kosovo War of 1998 and 1999, which resulted in withdrawal of Serbian armed forces and establishment of the United Nations Interim Administration Mission in Kosovo. On 17 February 2008, Kosovo unilaterally declared its independence from Serbia. It has since gained diplomatic recognition as a sovereign state by 111 UN member states. Serbia refuses to recognize Kosovo as a state, although with the Brussels Agreement of 2013, it has accepted the legitimacy of its institutions. Kosovo has a lower-middle-income economy and has experienced solid economic growth over the last decade by international financial institutions, and has experienced growth every year since the onset of the global financial crisis in 2008. The entire region is commonly referred to in English simply as Kosovo and in Albanian as Kosova (definite form, [kɔˈsɔːva]) or Kosovë ("indefinite" form, [kɔˈsɔːv]). In Serbia, a formal distinction is made between the eastern and western areas; the term Kosovo (Косово) is used for the eastern part centred on the historical Kosovo Field, while the western part is called Metohija (Метохија) (known as Dukagjini in Albanian). Kosovo (Serbian Cyrillic: Косово, [kôsoʋo]) is the Serbian neuter possessive adjective of kos (кос) "blackbird", an ellipsis for Kosovo Polje, 'blackbird field', the name of a plain situated in the eastern half of today's Kosovo and the site of the 1389 Battle of Kosovo Field. The name of the plain was applied to the Kosovo Province created in 1864. In prehistory, the succeeding Starčevo culture and Vinča culture were active in the region. The area in and around Kosovo has been inhabited for nearly 10,000 years. During the Neolithic age, Kosovo lay within the area of the Vinča-Turdaş culture which is characterised by West Balkan black and grey pottery. Bronze and Iron Age tombs have been found in Metohija. The earliest traces documented in the territory of Kosovo belong to the Stone Age Period, namely there are indications that cave dwellings might have existed like for example the Radivojce Cave set near the spring of the Drin river, then there are some indications at Grnčar Cave in the Vitina municipality, Dema and Karamakaz Caves of Peć and others. However, human settlement during the Paleolithic or Old Stone Age is not confirmed yet and not scientifically proven. Therefore, until arguments of Paleolithic and Mesolithic man are confirmed, Neolithic man, respectively the Neolithic sites are considered as the chronological beginning of population in Kosovo. From this period until today Kosovo has been inhabited, and traces of activities of societies from prehistoric, ancient and up to medieval time are visible throughout its territory. Whereas, in some archaeological sites, multilayer settlements clearly reflect the continuity of life through centuries. The earliest reference of the Albanians comes from Michael Attaleiates, who spoke of the Arbanitai located around the hinterland districts of Dyrrachium (modern Durrës) on the Adriatic Sea. In the 1389 Battle of Kosovo, Ottoman forces defeated a coalition led by Lazar Hrebeljanović. Some historians, most notably Noel Malcolm argues that the battle of Kosovo in 1389 did not end with an Ottoman victory and "the Serbian statehood did survive for another seventy years." Soon after, Lazar's son accepted Turkish nominal vassalage (as did some other Serbian principalities) and Lazar's daughter was married to the Sultan to seal the peace. By 1459, Ottomans conquered the new Serbian capital of Smederevo, leaving Belgrade and Vojvodina under Hungarian rule until second quarter of the 16th century. Kosovo was part of the Ottoman Empire from 1455 to 1912, at first as part of the eyalet of Rumelia, and from 1864 as a separate province (vilayet). During this time, Islam was introduced to the population. The Vilayet of Kosovo was an area much larger than today's Kosovo; it included all today's Kosovo territory, sections of the Sandžak region cutting into present-day Šumadija and Western Serbia and Montenegro along with the Kukës municipality, the surrounding region in present-day northern Albania and also parts of north-western Macedonia with the city of Skopje (then Üsküp), as its capital. Between 1881 and 1912 (its final phase), it was internally expanded to include other regions of present-day Republic of Macedonia, including larger urban settlements such as Štip (İştip), Kumanovo (Kumanova) and Kratovo (Kratova). Serbs likely formed a majority of Kosovo's from the 8th to the mid-19th century. Some scholars, such as the historian Fredrick F. Anscombe, believe that medieval and Ottoman Kosovo was ethnically heterogeneous, with Serbs and Albanians dominating at different times. Although initially stout opponents of the advancing Turks, Albanian chiefs ultimately came to accept the Ottomans as sovereigns. The resulting alliance facilitated the mass conversion of Albanians to Islam. Given that the Ottoman Empire's subjects were divided along religious (rather than ethnic) lines, Islamisation greatly elevated the status of Albanian chiefs. Prior to this, they were organised along simple tribal lines, living in the mountainous areas of modern Albania (from Kruje to the Sar range). Soon, they expanded into a depopulated Kosovo, as well as northwestern Macedonia, although some might have been autochthonous to the region. However, Banac favours the idea that the main settlers of the time were Vlachs. During and after the Serbian–Ottoman War of 1876–78, between 30,000 and 70,000 Muslims, mostly Albanians, were expelled from the Sanjak of Niš and fled to the Kosovo Vilayet. After the Axis invasion of Yugoslavia in 1941, most of Kosovo was assigned to Italian-controlled Albania, with the rest being controlled by Germany and Bulgaria. A three-dimensional conflict ensued, involving inter-ethnic, ideological, and international affiliations, with the first being most important. Nonetheless, these conflicts were relatively low-level compared with other areas of Yugoslavia during the war years, with one Serb historian estimating that 3,000 Albanians and 4,000 Serbs and Montenegrins were killed, and two others estimating war dead at 12,000 Albanians and 10,000 Serbs and Montenegrins. An official investigation conducted by the Yugoslav government in 1964 recorded nearly 8,000 war-related fatalities in Kosovo between 1941 and 1945, 5,489 of whom were Serb and Montenegrin and 2,177 of whom were Albanian. It is not disputed that between 1941 and 1945 tens of thousands of Serbs, mostly recent colonists, fled from Kosovo. Estimates range from 30,000 to 100,000. There had been large-scale Albanian immigration from Albania to Kosovo which is by some scholars estimated in the range from 72,000 to 260,000 people (with a tendency to escalate, the last figure being in a petition of 1985). Some historians and contemporary references emphasize that a large-scale migration of Albanians from Albania to Kosovo is not recorded in Axis documents. Even though they were disproved by police statistics, they received wide attention in the Serbian press and that led to further ethnic problems and eventual removal of Kosovo's status. Beginning in March 1981, Kosovar Albanian students of the University of Pristina organised protests seeking that Kosovo become a republic within Yugoslavia and demanding their human rights. The protests were brutally suppressed by the police and army, with many protesters arrested. During the 1980s, ethnic tensions continued with frequent violent outbreaks against Yugoslav state authorities, resulting in a further increase in emigration of Kosovo Serbs and other ethnic groups. The Yugoslav leadership tried to suppress protests of Kosovo Serbs seeking protection from ethnic discrimination and violence. In July 1990, the Kosovo Albanians proclaimed the existence of the Republic of Kosova, and declared it a sovereign and independent state in September 1992. In May 1992, Ibrahim Rugova was elected its president in an election in which only Kosovo Albanians participated. During its lifetime, the Republic of Kosova was only officially recognised by Albania. By the mid-1990s, the Kosovo Albanian population was growing restless, as the status of Kosovo was not resolved as part of the Dayton Agreement of November 1995, which ended the Bosnian War. By 1996, the Kosovo Liberation Army (KLA), an ethnic Albanian guerrilla paramilitary group that sought the separation of Kosovo and the eventual creation of a Greater Albania, had prevailed over the Rugova's non-violent resistance movement and launched attacks against the Yugoslav Army and Serbian police in Kosovo, resulting in the Kosovo War. During the conflict, roughly a million ethnic Albanians fled or were forcefully driven from Kosovo. In 1999 more than 11,000 deaths were reported to the office of the International Criminal Tribunal for the former Yugoslavia prosecutor Carla Del Ponte. As of 2010, some 3,000 people were still missing, of which 2,500 are Albanian, 400 Serbs and 100 Roma. By June, Milošević agreed to a foreign military presence in Kosovo and the withdrawal of his troops. After the Yugoslav Army withdrew, over half of Kosovo's Serbs and other non-Albanians flew or were expelled and many of the remaining civilians were subjected to abuse. During the Kosovo War, over 90,000 Serbian and other non-Albanian refugees fled the war-torn province. In the days after the Yugoslav Army withdrew, over 200,000 (over half) Serb and other non-Albanians civilians were expelled from Kosovo and many of the remaining civilians were victims of abuse. After Kosovo and other Yugoslav Wars, Serbia became home to the highest number of refugees and IDPs (including Kosovo Serbs) in Europe. During and after the 1999 war, over three hundred Serb civilians who were taken across the border into Albania were killed in a "Yellow House" near the town of Burrel and had several of their organs removed for sale on the black market. These claims were investigated first by the ICTY who found medical equipment and traces of blood in and around the house. They were then investigated by the UN, who received witness reports from many ex-UK fighters who stated that several of the prisoners had their organs removed. Chief Prosecutor for the ICTY; Carla Del Ponte revealed these crimes to the public in her book; Madame Prosecutor in 2008, causing a large response. In 2011; French media outlet; France24 released a classified UN document written in 2003 which documented the crimes. Estimates of the number of Serbs who left when Serbian forces left Kosovo vary from 65,000 to 250,000 (194,000 Serbs were recorded as living in Kosovo in the census of 1991. But many Roma also left and may be included in the higher estimates). The majority of Serbs who left were from urban areas, but Serbs who stayed (whether in urban or rural areas) suffered violence which largely (but not entirely) ceased between early 2001 and the riots of March 2004, and ongoing fears of harassment may be a factor deterring their return. International negotiations began in 2006 to determine the final status of Kosovo, as envisaged under UN Security Council Resolution 1244. The UN-backed talks, led by UN Special Envoy Martti Ahtisaari, began in February 2006. Whilst progress was made on technical matters, both parties remained diametrically opposed on the question of status itself. After many weeks of discussions at the UN, the United States, United Kingdom and other European members of the Security Council formally 'discarded' a draft resolution backing Ahtisaari's proposal on 20 July 2007, having failed to secure Russian backing. Beginning in August, a "Troika" consisting of negotiators from the European Union (Wolfgang Ischinger), the United States (Frank G. Wisner) and Russia (Alexander Botsan-Kharchenko) launched a new effort to reach a status outcome acceptable to both Belgrade and Pristina. Despite Russian disapproval, the U.S., the United Kingdom, and France appeared likely to recognise Kosovar independence. A declaration of independence by Kosovar Albanian leaders was postponed until the end of the Serbian presidential elections (4 February 2008). Most EU members and the US had feared that a premature declaration could boost support in Serbia for the ultra-nationalist candidate, Tomislav Nikolić. In November 2001, the Organization for Security and Co-operation in Europe supervised the first elections for the Kosovo Assembly. After that election, Kosovo's political parties formed an all-party unity coalition and elected Ibrahim Rugova as President and Bajram Rexhepi (PDK) as Prime Minister. After Kosovo-wide elections in October 2004, the LDK and AAK formed a new governing coalition that did not include PDK and Ora. This coalition agreement resulted in Ramush Haradinaj (AAK) becoming Prime Minister, while Ibrahim Rugova retained the position of President. PDK and Ora were critical of the coalition agreement and have since frequently accused that government of corruption. Kosovo declared independence from Serbia on 17 February 2008. As of 27 February 2017, 111 UN states recognise its independence, including all of its immediate neighbours, with the exception of Serbia. Since declaring independence, it has become a member of the international institutions such as the International Monetary Fund and World Bank, though not of the United Nations. Kosovo has an area of 10,887 square kilometers. It lies between latitudes 42° and 43° N, and longitudes 20° and 22° E. The border of Kosovo is approximately 702 km (436 miles) long. It borders Albania to the southwest (112 km), Macedonia to the southeast (159 km), Montenegro to the west (79 km), and Central Serbia to the north and east (352 km). Most of its terrain is mountainous; the highest peak is Đeravica with 2,656 m (8,714 ft). There are two main plain regions, the Metohija basin in the west, and the Plain of Kosovo in the east. The main rivers of the region are the White Drin, running towards the Adriatic Sea, the South Morava in the Goljak area, and Ibar in the north. Sitnica, a tributary of Ibar, is the longest river lying completely within Kosovo. 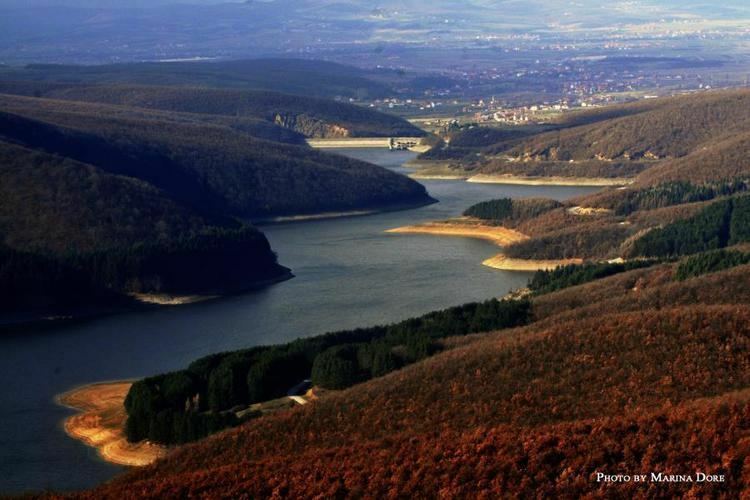 The biggest lakes are Gazivoda, Radonjić, Batlava and Badovac. The largest cities are Pristina, the capital, with an estimated 198,000 inhabitants, Prizren on the southwest, with a population of 178,000, Peć in the west with 95,000 inhabitants, and Ferizaj in the south at around 108,000. 39.1% of Kosovo is forested, about 52% is classified as agricultural land, 31% of which is covered by pastures and 69% is arable. Phytogeographically, Kosovo belongs to the Illyrian province of the Circumboreal Region within the Boreal Kingdom. According to the WWF and Digital Map of European Ecological Regions by the European Environment Agency, the territory of Kosovo belongs to the ecoregion of Balkan mixed forests. The 39,000 ha Šar Mountains National Park, established in 1986 along the border with the Republic of Macedonia, is the only national park in Kosovo, although the Balkan Peace Park in the Prokletije along the border with Montenegro has been proposed as another one. The Nerodimka river, near Ferizaj, is the only example in Europe of a river dividing with its waters flowing into two different seas. Kosovo has a humid continental climate with Mediterranean and oceanic influences, featuring warm summers and cold and snowy winters. Precipitation ranges from 600 to 1,300 mm (24 to 51 in) per year, and is well distributed year-round. 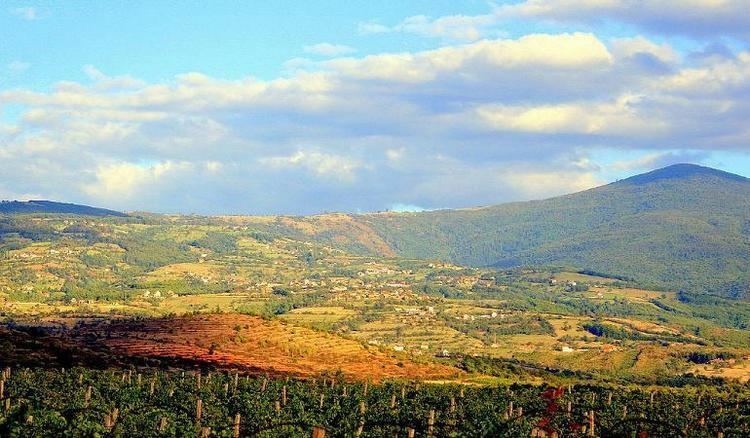 To the northeast, Kosovo field and Ibar river valley are drier (with total precipitation of about 600 millimetres (24 inches) per year) and more influenced by continental air masses, with colder winters and very hot summers. In the southwest, climatic area of Metohija receives more Mediterranean influences with warmer summers, somewhat higher precipitation (700 mm (28 in)) and heavy snowfalls in the winter. Mountainous areas of Prokletije in the west, Šar Mountains on the south and Kopaonik in the north have a more alpine climate, with high precipitation (900 to 1,300 mm (35 to 51 in) per year), short and fresh summers, and cold winters. The average annual temperature of Kosovo is 9.5 °C (49.1 °F). The warmest month is July with average temperature of 19.2 °C (66.6 °F), and the coldest is January with −1.3 °C (29.7 °F). Except Prizren and Istok, all other meteorological stations in January recorded average temperatures under 0 °C (32 °F). The flora and fauna of Kosovo forests is quite rich due to the exposure to Mediterranean climate through the White Drin valley. In that context, the Šar Mountains and the Prokletije are the two most important areas of the biodiversity. The woodlands of Sharr are habitat to 86 vascular plants of international significance, while the Prokletije house 128 endemic species. The flora is represented by 139 orders classified in 63 families, 35 genera and 20 species. It has a significance for the entire region of Balkans – although Kosovo represents only 2.3% of the entire surface of Balkans, in terms of vegetation it represents 25% of the Balkans flora and about 18% of the European flora. The fauna is composed of a wide range of species due to its relief, ecological factors and geographic location. The forests with the greatest varieties are the ones located in the Šar, Prokletije, Kopaonik and Mokna. Kosovo is a multi-party parliamentary representative democratic republic. The country is governed by legislative, executive and judicial institutions which derive from the Constitution which was adopted in June 2008, although until the Brussels Agreement, North Kosovo was in practice largely controlled by institutions of the Republic of Serbia or parallel institutions funded by Serbia. The Legislative is vested in both the Parliament and the ministers within their competencies. The Government exercises the executive power and is composed of the Prime Minister as the head of government, the deputy prime ministers, and the ministers of the various ministries. The Judiciary is composed of the Supreme Court and subordinate courts, a Constitutional Court, and independent prosecutorial institutions. There also exist multiple independent institutions defined by the Constitution and law, as well as local governments. It specifies that the country is a secular state and neutral in matters of religious beliefs. Freedom of belief, conscience and religion is guaranteed with religious autonomy ensured and protected. All citizens are equal before the law and gender equality is ensured by the constitution. The Constitutional Framework guarantees a minimum of ten seats in the 120-member Assembly for Serbs, and ten for other minorities, and also guarantees Serbs and other minorities places in the Government. The President (Presidenti) serves as the head of state and represents the unity of the people, elected every five years, indirectly by the National Assembly, in a secret ballot by a two thirds majority of all deputies of the Assembly. The president invested primarily with representative responsibilities and powers. The head of state has the power to return draft legislation to the Assembly for reconsideration, and has a role in foreign affairs and certain official appointments. The current President is Hashim Thaçi since 2016. The Prime Minister (Kryeministri) serves as the head of government elected by the National Assembly. Ministers are nominated by the Prime Minister, and then confirmed by the Assembly. The Prime Minister is the leader of the party with the most seats in the National Assembly. The head of government exercises executive power of the country. The current Prime Minister is Ramush Haradinaj His government consists of Albanians, as well as ministers from Kosovo's minorities, which include Bosniaks, Turks and Serbs. Foreign relations are conducted through the Ministry of Foreign Affairs in Pristina. The current minister is Enver Hoxhaj. As of 2017, 111 out of 193 UN member countries recognise the Republic of Kosovo. The nation is member of the International Monetary Fund (IMF), the World Bank, the International Road and Transport Union (IRU), the Regional Cooperation Council, the Council of Europe Development Bank, the Venice Commission and the European Bank for Reconstruction and Development. It has gained full membership in many major sports federations. Within the European Union, it is recognised by 23 of the 28 members and is a potential candidate for the future enlargement of the European Union. In November 2015, Kosovo's bid to become a member of UNESCO but fell three votes short of the two-third majority required to join. Almost 21 countries maintain embassies in Kosovo. The Republic of Kosovo maintains 24 embassies and 28 consular missions abroad. The relations with Albania are in a special case, considering that the two countries share the same language. The Albanian language is one of the official languages of Kosovo. Albania has an embassy in the capital Pristina and Kosovo an embassy in Tirana. In 1992, Albania was the only country whose parliament voted to recognise the Republic of Kosova. Albania was one of the first countries to officially announce its recognition of the sovereign Republic of Kosovo in February 2008. The Global Peace Index 2015 ranked Kosovo 69th out of 163 countries. The President holds the title of commander-in-chief of the national armed forces. The current Minister of Security Forces is Haki Demolli. Citizens over the age of 18 are eligible to serve in the Kosovo Security Force. Members of the force are protected from discrimination on the basis of gender or ethnicity. The North Atlantic Treaty Organisation (NATO) led the Kosovo Force (KFOR) and the Kosovo Protection Corps (KPC) in 2008, started preparations for the formation of the Kosovo Security Force. In 2014, the former Prime Minister Hashim Thaçi declared, that the National Government had decided to establish a Defence Ministry in 2019, officially transform the Kosovo Security Forces into the Kosovan Armed Forces, an Army which meets all the standards of NATO members with the aim to join the alliance in the future. The relations between Kosovo-Albanians and Serbs have been hostile since the rise of nationalism in the Balkans during the 19th century. During Communism in Yugoslavia, the ethnic Albanians and Serbs were strongly irreconcilable with sociological studies during the Tito-era indicating that ethnic Albanians and Serbs rarely accepted each other as neighbours or friends and few held interethnic marriages. Ethnic prejudices, stereotypes and mutual distrust between ethnic Albanians and Serbs have remained common for decades. The level of intolerance and separation between both communities during the Tito-period was reported by sociologists to be worse than that of Croat and Serb communities in Yugoslavia which also had tensions but held some closer relations between each other. Until 2007, Kosovo was divided into 30 municipalities. It is currently subdivided into seven districts and divided into 38, according to Kosovo law and the Brussels Agreement of 2013, which stipulated the formation of new municipalities with Serb majority populations. These municipalities, 10 altogether, are in the process of forming a Community of Serb Municipalities encompassing approximately 90% of the Serb population in Kosovo. According to the Kosovo in Figures 2005 Survey of the Statistical Office of Kosovo, Kosovo's total population is estimated between 1.9 and 2.2 million with the following ethnic composition: Albanians 92%, Serbs 4%, Bosniaks and Gorans 2%, Turks 1%, Roma 1%. CIA World Factbook estimates the following ratio: 88% Albanians, 8% Kosovo Serbs and 4% other ethnic groups. According to CIA The World Factbook estimated data from July 2009, Kosovo's population stands at 1,804,838 persons. It stated that ethnic composition is "Albanians 88%, Serbs 7%, other 5% (Bosniak, Gorani, Roma, Turk, Ashkali, Egyptian, Janjevci – Croats)". Albanians, steadily increasing in number, have constituted a majority in Kosovo since the 19th century, the earlier ethnic composition being disputed. Kosovo's political boundaries do not quite coincide with the ethnic boundary by which Albanians compose an absolute majority in every municipality; for example, Serbs form a local majority in North Kosovo and two other municipalities, while there are large areas with an Albanian majority outside of Kosovo, namely in the neighbouring regions of former Yugoslavia: the north-west of Macedonia, and in the Preševo Valley in Southern Serbia. At 1.3% per year (2008 data), ethnic Albanians in Kosovo have the fastest rate of growth in population in Europe. Over an 82-year period (1921–2003) the population of Kosovo grew to 460% of its original size. Whereas Albanians constituted 60% of Kosovo's 500,000 person population in 1931, by 1991 they reached 81% of Kosovo's 2 million person population. In the second half of the 20th century, Kosovo Albanians had three times higher birth rates than Serbs. In addition, most of Kosovo's pre-1999 Serb population relocated to Serbia proper following the ethnic cleansing campaign in 1999. According to the Constitution, Albanian and Serbian are the official languages of Kosovo. Almost 95% of the population speaks Albanian as their native language, followed by South Slavic languages and Turkish. Due to North Kosovo's boycott of the census, Bosnian resulted in being the second-largest language after Albanian. However, Serbian is de facto the second most spoken language in Kosovo. Since 1999, the Albanian language has become the dominant language in the country, although equal status is given to Serbian and special status is given to other minority languages. The National Assembly adopted the Law on the Use of Languages in 2006 committed Kosovo institutions to ensuring the equal use of Albanian and Serbian as the official languages. Additionally, other languages can also gain recognition at municipal level as official languages if the linguistic community represents at least 5% of the total population of municipality. The Law on the Use of Languages gives Turkish the status of an official language in the municipality of Prizren, irrespective of the size of the Turkish community living there. Although both Albanian and Serbian are official languages, municipal civil servants are only required to speak one of them in a professional setting and, according to Language Commissioner of Kosovo Slaviša Mladenović statement from 2015, no organizations have all of their documents in both languages. Kosovo is a secular state with no official state religion. The Constitution provides for freedom of religion and conscience. According to the 2011 Census, 95.6% of the population of Kosovo are Muslims though this seems inflated as 7 to 8% are Christians. These figures do not represent individual sects operating in the country such as the Sufism or Bektashism, which are sometimes classified generally under the category of Islam. 3.69% of the population are Catholic and an equal number or up to 5% Orthodox. The Catholic Albanian communities are mostly concentrated in the cities of Gjakova, Prizren, Klina, and a few villages near Peć and Vitina. The Serb minority is largely Serbian Orthodox. Christianity has a long-standing tradition in the country, dating back to the Illyrians and Romans. During the Middle Ages, the entire Balkan peninsula had been Christianized by both the Romans and Byzantines. From 1389 until 1912, Kosovo was officially governed by the Ottoman Empire and a high level of Islamization occurred. After the second World War, the country was ruled by secular socialist authorities in the Socialist Federal Republic of Yugoslavia. During that period, the population of Kosovo became increasingly secularized. Today, over 90% of its population are from Muslim backgrounds, most of whom are ethnic Albanians but also including Slavs (who mostly identify themselves as Gorani or Bosniaks) and Turks. According to the 2014 Freedom of Thought reports by the IHEU, the nation was ranked first in the Southern Europe and ninth in the world as Free and equal for tolerance towards religion and atheism. Nowadays the situation has changed and health care system in Kosovo is organised in three sectors including, primary, secondary and tertiary health care. Primary health care in Pristina is organised in thirteen family medicine centres and fifteen ambulantory care units. Secondary health care is decentralised in seven regional hospitals. Pristina does not have any regional hospital and instead uses University Clinical Center of Kosovo for health care services. University Clinical Center of Kosovo provides its health care services in twelve clinics, where 642 doctors are employed. At a lower level, home services are provided for several vulnerable groups which are not able to reach health care premises. Kosovo health care services are now focused on patient safety, quality control and assisted health. Education for primary, secondary, and tertiary levels are mostly are predominantly public and supported by the state, run by the Ministry of Education. Education takes place in two main stages: primary and secondary education and higher education. The primary and secondary education is subdivided into four stages such as the preschool education, the primary and low secondary education, high secondary education and the special education. The preschool education is for children from the age of one to five. The primary and secondary education is obligatory for everyone. It is provided by gymnasiums and vocational schools and also available in languages of recognized minorities in the country, where classes are held in Albanian, Serbian, Bosnian, Turkish and Croatian. The first phase (primary education) includes classes from one to five and the second phase (low secondary education) classes from six to nine. The third phase (high secondary education) consist the general education but also the professional education, that is focused on different fields. It lasts four years. However, pupils offers possibilities of applying for higher or university studies. According to the Ministry of Education, children who are not able to get a general education, are able to get a special education (fifth phase). Higher education can be received in universities and other higher education institutes. These educational institutions offer studies for Bachelor, Master and PhD degrees. The students may choose full-time or part-time studies. The Economy of Kosovo is a transition economy. The nations economy suffered from the combined results of political upheaval, the following Yugoslav wars, the Serbian dismissal of Kosovo employees and international sanctions on Serbia of which it was then part. Since Kosovo's Independence in 2008, the economy has grown every year. Despite declining foreign assistance, growth of GDP averaged over 5% a year. This was despite the Global financial crisis of 2009 and the subsequent Eurozone crisis. Additionally, the inflation rate was low. The most economic development, has taken place in the trade, retail and construction sectors. Kosovo is highly dependent on remittances from the Diaspora, FDI and other capital inflows. Kosovo's largest trading partners are Albania, Italy, Switzerland, China, Germany and Turkey. The Euro is the official currency of country. The Government of Kosovo have signed a free-trade agreements with Croatia, Bosnia and Herzegovina, Albania and the Republic of Macedonia. Kosovo is a Central European Free Trade Agreement (CEFTA) member, agreed with UNMIK, and enjoys a free trade within the non-European Union countries. Currently, there are two main motorways in Kosovo including the R7 connecting Kosovo with Albania and the R6 connecting Pristina with the Macedonian border at Hani i Elezit. The construction of the new R7.1 Motorway began in 2017. The R7 Motorway (part of Albania-Kosovo Highway) links Kosovo to Albania's Adriatic coast in Durrës. Once the remaining European route (E80) from Pristina to Merdare section project will be completed, the motorway will link Kosovo through the present European route (E80) highway with the Pan-European corridor X (E75) near Niš in Serbia. The R6 Motorway is currently under construction. Forming part of the E65, it is the second motorway constructed in the region and it links the capital Pristina with the Macedonian border at Elez Han, which is about 20 km (12 mi) from Skopje. Construction of the motorway started in 2014 and it is going to be finished in 2018. The nation hosts two Airports such as the Gjakova Airport and the only International Airport of Pristina. The Gjakova Airport was built by the Kosovo Force (KFOR) following the Kosovo War, next to an existing airfield used for agricultural purposes, and was used mainly for military and humanitarian flights. The local and national government plans to offer Gjakova Airport for operation under a public-private partnership with the aim of turning it into a civilian and commercial airport. The Pristina International Airport is located southwest of Pristina. It is Kosovo's only international airport and the only port of entry for air travelers to Kosovo. The natural values of Kosovo represent quality tourism resources. The description of Kosovo's potential in tourism is closely related to its geographic position. Its position in the centre of the Balkan Peninsula in south-eastern Europe represents a crossroads which historically dates back to Illyrian and Roman times. With its central position in the Balkans, it serves as a link in the connection between central and south Europe, the Adriatic Sea, and Black Sea. The mountainous south of Kosovo has great potential for winter tourism. Skiing takes place at the winter resort Brezovica in the Šar Mountains. It offers perfect weather and snow conditions for ski seasons from November to May. The New York Times included Kosovo on the list of 41 Places to go in 2011. In the same year, Kosovo saw a jump of about 40 places on the Skyscanner flight search engine which rates global tourism growth. Kosovo is generally rich with mountains, artificial lakes, canyons and rivers and therefore also offers prime possibilities for hunting and fishing. Brezovica also includes three hotels with 680 rooms, two restaurants and nine ski lifts with a transport capacity of 10,000 skiers per hour. With close proximity to Pristina International Airport (60 km) and Skopje Airport (70 km), the resort is a possible destination for international tourists and has the potential to become the most desired winter tourism destination in the Balkans. The Architecture of Kosovo dates back to the Neolithic Period and includes the Copper, Bronze and Iron Ages, Antiquity and the Medieval period. It has been influenced by the presence of different civilizations and religions as evidenced by the structures which have survived to this day. In 2004, UNESCO recognized the Visoki Dečani monastery as World Heritage Site for its outstanding universal value. Two years later, the site of patrimony was extended as a serial nomination, to include three other religious monuments: Patriarchate of Peć, Our Lady of Ljeviš and Gračanica monastery under the name of Medieval Monuments in Kosovo. It is consisting of four Serbian Orthodox churches and monasteries which represent the fusion of the eastern Orthodox Byzantine and the western Romanesque ecclesiastical architecture to form the Palaiologian Renaissance style. The construction was founded by members of Nemanjić dynasty, the most important dynasty of Serbia in the Middle Ages. Kosovan art was unknown to the international public for a very long time, because of the regime, many artists were unable to display their art in art galleries, and so were always on the lookout for alternatives, and even resorted to taking matters into their own hands. During the Kosovo War, many studios were burned down and many artworks were destroyed or lost. Until 1990, artists from Kosovo presented their art in many prestigious worldwide renowned centers. They were affirmed and evaluated highly because of their unique approach to the arts considering the circumstances in which they were created, making them distinguished and original. The cuisine in Kosovo is similar to the cuisine of the surrounding places (Albania, Montenegro, Greece), and has been significantly influenced by Turkish cuisine and Albanian cuisine. Common dishes include burek, pies, flija, kebab, suxhuk and other sausages, stuffed peppers, lamb, beans, sarma, burjan, pita and rice. Bread and dairy are important staples in Kosovar Albanian cuisine. The most widely used dairy products are milk, yogurt, ayran, spreads, cheese and kaymak. Meat (beef, chicken and lamb), beans, rice and peppers are, likewise, major parts of the Kosovo Albanian diet. Vegetables are used seasonally. Usually, cucumbers, tomatoes and cabbage are pickled. Herbs such as salt, black pepper, red pepper and Vegeta are also popular. Traditional Kosovan desserts are often made with sherbet, which is cooked sugar with either lemon or vanilla flavor. Baklava is one of the most widely used pastries in Kosovo. 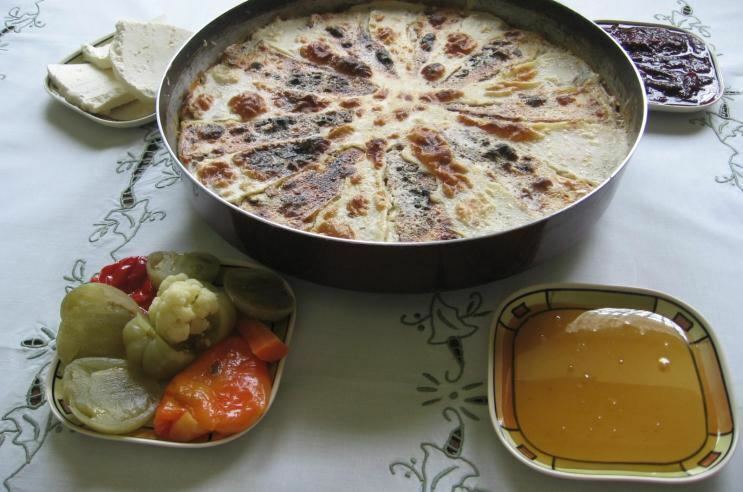 Another is Kajmaçin, which is composed of baked eggs, mixed with sugar and oil. Sheqer Pare is a pastry similar to baklava, as it is topped with sherbet. Other pastries such as Kaqamak, Tespishte, Rovani, Tulluma and Pallaqinka are also a very popular breakfast foods in Kosovo. They are usually topped with Nutella, cheese, or honey. Shampite or Llokuma is served as a treat for children, and mostly as the first treat to guests on the days of Bajram. The International Documentary and Short Film Festival is the largest film event in Kosovo. The Festival is organized in August in Prizren which attracts numerous international and regional artists. In this annually organized festival films are screened twice a day in three open air cinemas as well as in two regular cinemas. Except for its films, the festival is also well known for lively nights after the screening. Various events happen within the scope of the festival: workshops, DokuPhoto exhibitions, festival camping, concerts, which altogether turn the city into a charming place to be. In 2010 Dokufest was voted as one of the 25 best international documentary festivals.In 2010 Dokufest was voted as one of the 25 best international documentary festivals. Although the music in Kosovo is diverse, authentic Albanian and Serbian music still exist. Albanian music is characterised by the use of the Çifteli (authentic Albanian instrument), mandolin, mandola and percussion. Classical music is well known in Kosovo and has been taught at several music schools and universities (at the University of Prishtina Faculty of Arts in Pristina and the University of Priština Faculty of Arts at Mitrovica). In 2014 Kosovo submitted their first film for the Academy Award for Best Foreign Language Film, with Three Windows and a Hanging directed by Isa Qosja. Serbian music from Kosovo presents a mixture of traditional music, which is part of the wider Balkan tradition, with its own distinctive sound, and various Western and Turkish influences. Serb songs from Kosovo were an inspiration for 12th song wreath (sr. Руковет) by composer Stevan Mokranjac. Most of Serbian music from Kosovo was dominated by church music, with its own share of sung epic poetry. Serbian national instrument Gusle is also used in Kosovo. Viktorija, a singer from Vučitrn, is only artist from Kosovo who represented Yugoslavia in the Eurovision Song Contest as part of Aska in 1982. Some of Kosovo Albanians artists compete in the Festivali i Këngës, the national selection for Albania. The Kosovo Albanian singer, Rona Nishliu, ended 5th in the grand final in 2012 and Lindita will represent Albania in 2017. Some singers from Kosovo, especially Kosovo Serbs, participate in Serbian national selection organized by RTS. Nevena Božović represented Serbia in the Junior Eurovision Song Contest 2007 and, as member of Moje 3, in the Eurovision Song Contest 2013. Sports marks an important way in the society of Ksovo. The most popular sports in Kosovo are football, basketball, judo, boxing, volleyball and handball. In December 9, 2014, the Olympic Committee of Kosovo became a full member of the International Olympic Committee (IOC). The nation participated at the 2015 European Games and the 2016 Summer Olympics. The most popular sport in the country is by far football. It was first codified in 1946. In 1922, the first clubs were formed such as the FC Gjakova and FC Prishtina. During the cold war era from 1945 until 1991, football in former Yugoslavia was advancing so fast that in 1946 it was formed the Federation of Kosovo, as a subsidiary of the Federation of Yugoslavia. FC Prishtina became the most successful club in the First Leagues of Yugoslavia, while KF Trepça was part of the league for one year. In 1991, the first independent Federation of Kosovo were founded, after all football players, almost from Kosovo, were banned from the League in Yugoslavia. The first game was held in the stadium of KF Flamurtari on September 13, 1991 in Prishtina, which marked in the same time the start of the first independent championship in Kosovo. The governing body in the country, is mainly responsible for national team and the most main cup competitions. Three football players born in Kosovo (Milutin Šoškić, Fahrudin Jusufi, Vladimir Durković) was part of Yugoslavia national football team, who won gold medal at the 1960 Summer Olympics and silver medal at the 1960 European Championship. Stevan Stojanović from Kosovo, who played for Yugoslavia was part of Red Star Belgrade and they won 1990–91 European Cup. Nowadays, in many European teams there are players of Albanian origin from Kosovo how had the opportunity to show their talents and values. Thus, Lorik Cana was the captain of Olympique de Marseille and Sunderland A.F.C as well as the Albanian national team, while Valon Behrami who played for West Ham United F.C., and currently is playing for Watford FC and Swiss national football team. There are other players who had the opportunity to play for European Football Teams such as Xherdan Shaqiri, who plays as a midfielder for Stoke City and for the Switzerland national football team or Adnan Januzaj. Basketball is also one of the favourite sports of the people in Kosovo. The first championship was held in 1991, with the participation of eight teams. The Basketball Federation of Kosovo was accepted as a full member of FIBA on March 13, 2015. Notable players born in Kosovo who played for the successful Yugoslavia and Serbia national teams include Zyfer Avdiu, Marko Simonović and Dejan Musli. Some of them are continued to competing for Serbia after recognition of Kosovo from FIBA. The country ranked 58th in the 2008 Press Freedom Index report compiled by the Reporters Without Borders, while in 2016, it ranked 90th. Pristina is an important fashion design, production and trade hub in the Albanian-speaking territories. Kosovo has been well documented for its success in global beauty pageantry at Miss Universe. Furthermore, Miss Kosovo is a closely followed event throughout the Kosovo. The first titleholder was Zana Krasniqi, who placed as a Top 10 finalist at the 2008 Miss Universe pageant. She is the first ever Kosovo-Albanian woman to enter and place in the contest finishing 6th, just two tenths of a point from the top five. The following year turned out to be another success for the Miss Universe Kosovo pageant: Marigona Dragusha placed second runner-up to Miss Universe 2009 in the Bahamas making her to be the first delegate from Kosovo to make it top the top five.